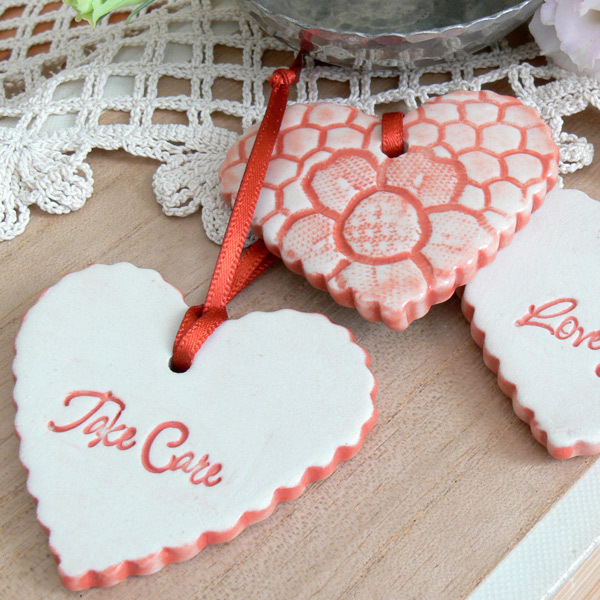 Tell us all about your designs and where the initial idea came from to incorporate the use of vintage lace doilies. I was originally inspired by a a couple of beautifully crafted doilies that I discovered in a random box at St Vinnie’s. They had been given away due to some discoloration yet had such lovely patterns that I started to think of ways I could reuse these little works of art and incorporate them into modern, decorative and functional pieces, revamping them to highlight the beauty of their intricate patterns and texture. 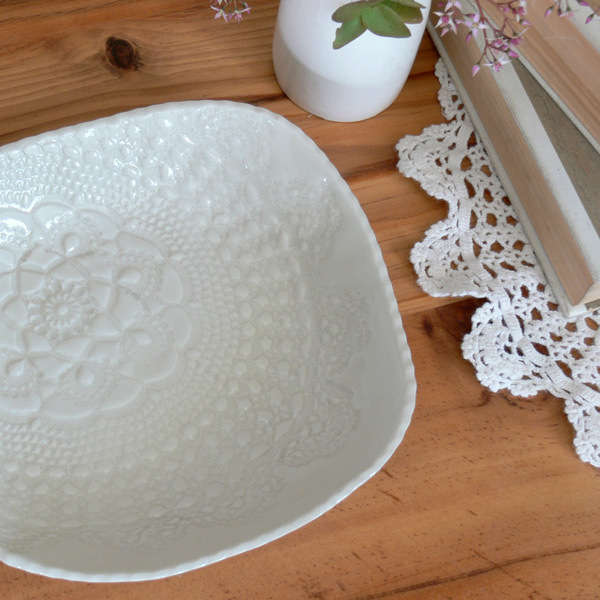 After a lot of trial and error – as certainly not all doilies are suitable for making beautiful impressions into the clay – I have developed a series of bowls, dishes and ornaments that feature a range of gorgeous patterns. What was your background before starting your label? I’ve been passionate about art & craft for as long as I can remember and throughout the years completed many arts-based courses involving painting, ceramics and drawing. My professional background is in graphic design (which I love) however after nearly ten years in the industry, working almost exclusively via computer, I found myself missing the process of creating art and craft by hand. As a result I made the decision in 2008 to leave my job as senior designer at a boutique design studio and start my own business called Udessi (www.udessi.com.au – an online gallery shop showcasing affordable, unique, contemporary Australian art & craft). One of the great advantages of running Udessi from home is that I’ve been allowed the time and space to get my hands dirty and get back into making ceramics. I’m also fulfilled by working with the very talented artists involved and being able to give them the opportunity to promote their work to a wider audience. I’m still a freelance designer and am currently working on some wonderful branding projects, so at the moment I feel very lucky to be combining the best of both worlds! I draw most of my inspiration from the people in my life. My family is my world and I have been fortunate in that they have always supported and encouraged me to be creative. The artists I work with through Udessi are also a huge inspiration (as is the creative blog community). Each artist has their own unique story that they paint, stitch, draw and build into their work, and their passion for what they do is never-ending. Their enthusiasm and dedication is so inspiring and when they share their frustrations over the fragility of the creative process I’m reassured that I’m not the only one who sometimes has days where nothing seems to work! Describe for us a typical day in the life of Kim. Most of my time is spent working on the Udessi online gallery – photographing new pieces that have come in, uploading updates to the website and blog, meeting with artists, brainstorming marketing strategies and creating my own works to sell. I have set up a studio in the garage to produce my ceramics and this keeps the mess separated from the office and other parts of the house, ensuring my husband’s sanity! 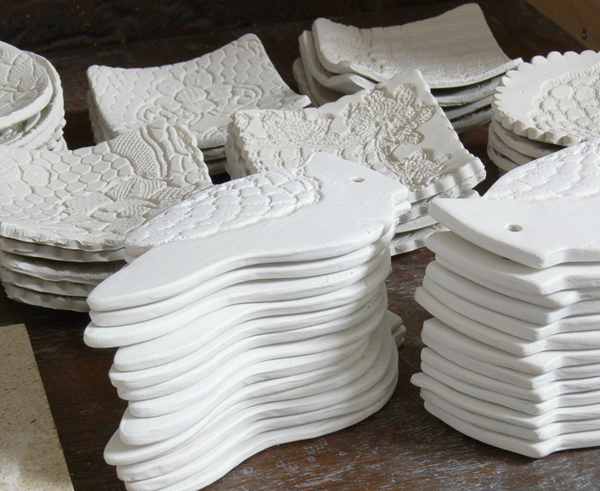 I love working on the ceramics, it’s my time out and relaxes me after a busy day. You have to be calm when working with clay – rushing or being too impatient usually results in the clay cracking or pieces breaking. It’s almost meditative, forcing me to take a deep breath and let go of everything else just for a little while. Where do you see your label going in the future? I’m very excited about the range of pendants and jewellery that I am currently developing and am also working on some new pieces involving hand carving and hand painting. I am continually experimenting with new techniques and ideas and while sometimes the results (most happily) exceed my expectations, there is a lot of trial and error involved and I have a lovely collection of seconds taking up a shelf in my cupboard! What has been the most challenging aspect of your business? 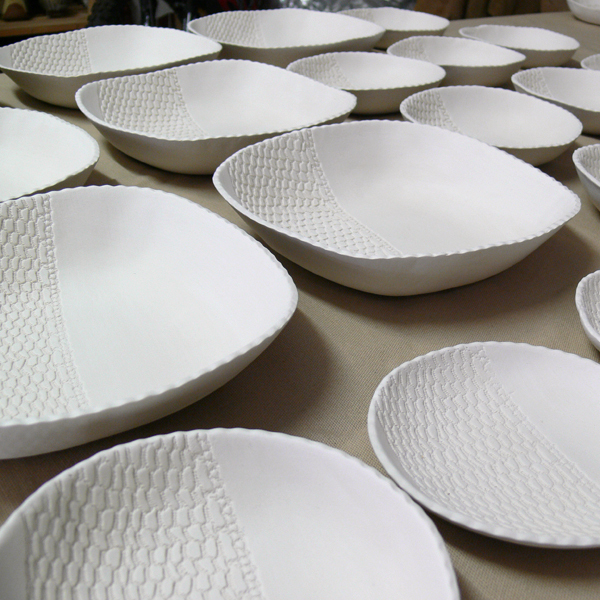 When it comes to ceramics, the drying & firing processes involved come with many surprises & challenges. The clay is very fragile during the drying process, and has to be handled with great care to ensure it doesn’t crack or break. 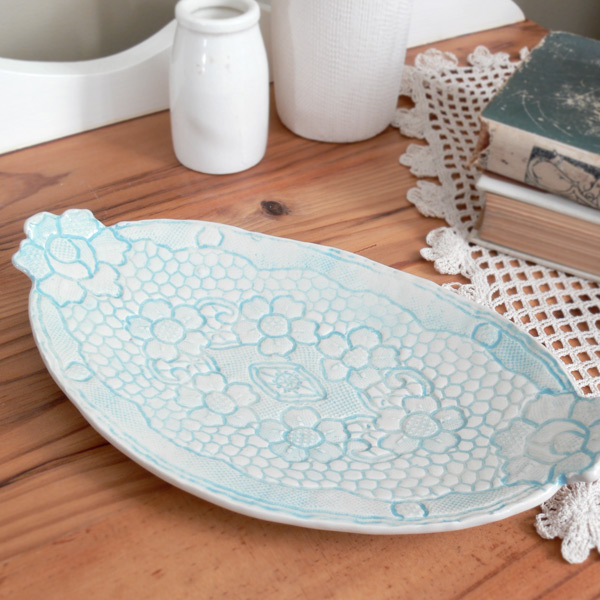 Pieces that seem fine during the drying process sometimes emerge out of the kiln warped or cracked, which can be caused by a variety of reasons… or sometimes for no apparent reason at all! The slightest change in temperature during firing may result in glazes turning out differently from one firing to the next. It can be quite heart-breaking to lose pieces that you have worked so hard on and at times is still a bit nerve-wracking for me to see what comes out of the kiln and whether I’ll be pleasantly surprised or not! Thankfully though, more often than not I’m rewarded for my patience and hard work – seeing a range of my original pieces together and receiving the encouraging feedback from customers and fellow artists makes it very addictive to keep creating! 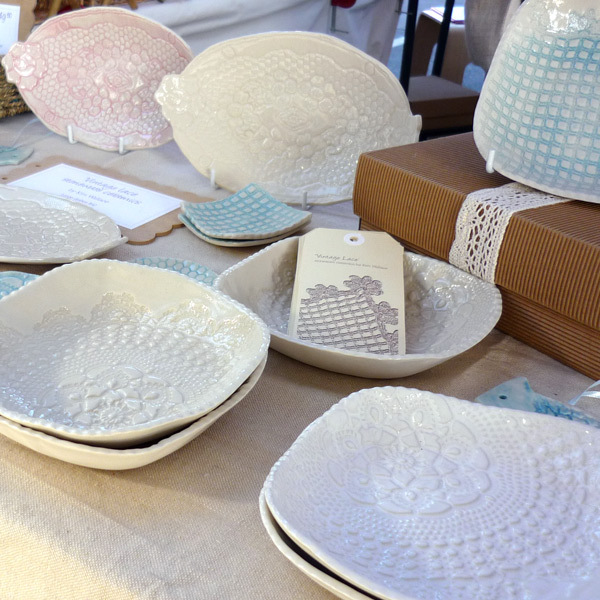 Looks like my list of things to buy at FK Brisbane will begin with these ceramics…amazing! Thank you for the great profile piece on Kim – so interesting to find out more about her passions. And I can’t wait to see her new jewellery line to add to my collection! Thanks so much for featuring my work, it’s very exciting. I’m really looking forward to this weekend and being part of the first ever Brissy Finders Keepers! What a brilliant way of preserving these beautiful old textiles and turning them into something new and fresh. LOVING all of this! Especially all of those white bowls!